A Parenting Wonder Tool! An End To Debates Regarding Time With Kids. Little Cub is into construction vehicles these days. And in a big way too – he checks out construction related books and toys at stores, builds vehicles that resemble trucks with his blocks, spots any JCB/dump truck/road roller within range and last but definitely not least, watches construction videos on YouTube. I’m not sure how the YouTube obsession started, but once Cub realized that there was a sea of videos of construction vehicles out there, we had a problem on our hands. He’s not much of a TV-watcher, but YouTube? Oh, yeah. The hubs and I were worried. After we spent a few minutes blaming each other, we decided we needed to join forces to tackle the problem. Cutting it off completely would be too harsh. Restricting his YouTube time was the solution. Me: Sweetie, time’s up. It’s 10 minutes already. Me: Yes, look at the clock. Your 10 minutes are over. Cub: No, still time left. Me (losing my temper): No, there isn’t! Enough! And that led to another tantrum. We were at our wits’ end, wondering what to do, when the timer I ordered online arrived. 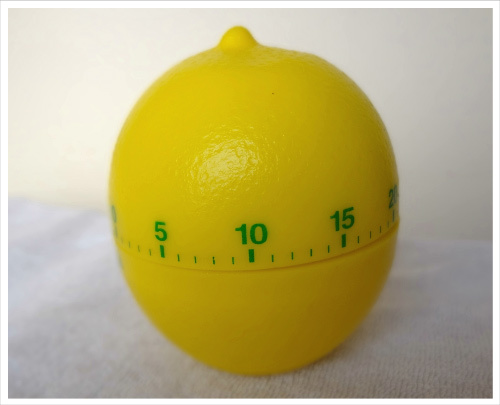 A nice, yellow, lemon shaped timer. A bulb clicked on somewhere. Hmmm. Before Cub’s next YouTube session, I explained how the timer worked. He seemed intrigued by this new device and agreed to stop when he heard the timer ring. I know this sounds unbelievable, but he actually did!! The timer rang, and he stopped, albeit reluctantly. There was no questioning the time now!! I was on cloud 9!! Eureka!! This was going to solve so many problems!! On his next play date, the kids began fighting over a new truck (what else). Then I applied the timer rule – 5 minutes for each child and then pass on the toy when the timer rings. Again, it worked like a charm!! No arguing or whining – King Timer rules!! Having trouble making the kids clean up their mess? Never fear when Timer’s here :). I set the timer, and make it a challenge to clean up the mess before it goes off. Nothing like some competitive spirit to get your living room clean :). So now that I’ve discovered the new parenting wonder tool, I couldn’t help but share it with all of you. It’s amazing how a simple, inexpensive device can simplify complicated negotiations and bring to an end seemingly endless debates regarding time. Go get one if you haven’t got it already, and be prepared to be amazed! !